The Baa Baa Brighouse Easter Bank Holiday Sale is now on! We’re offering up to an amazing 50% off all hand knits and up to 25% off on selected yarns and patterns. 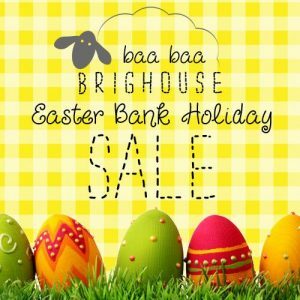 Our Easter event ends at midnight on Monday April 6th, so why not treat yourself to some super Spring savings and stock up on beautiful Yorkshire yarn or pretty patterns to keep you busy over the coming months. We ship worldwide and every time you order from Baa Baa Brighouse, you’ll earn Shepherd Rewards to redeem against future purchases. There’s nothing quite like receiving a beautifully wrapped Baa Baa Brighouse parcel through the post – just read our reviews to see what our existing customers have to say. Baa Baa Brighouse Joins Yarn Shop Day 2015!